This week was full of great stories, news, and announcements in pop culture and entertainment news. Here’s this week’s rundown! Golfers got a surprise this week when a small plan crashed on to a golf course and out walks “Indiana Jones’” Harrison Fords walks out. 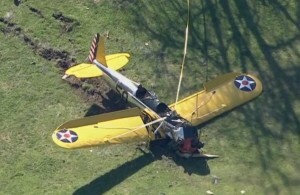 Ford’s vintage, single-engine, airplane was reported to have engine failure. “Dad is ok. Battered, but ok!” Ford’s son Ben tweeted. That wasn’t the only surprise we got this week. 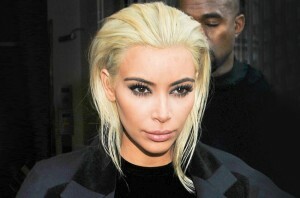 Kim Kardashian – West revealed her new bleach blonde hair. On Thursday March 5, mom of baby North West gave us all one more reason to take a second look at her. In an interview with People Magazine she said the legendary Madonna inspired her new look. “I’ve always had this image of Madonna with platinum hair in my references folder on my computer and I’ve been waiting a long time to try the look. I thought what better time than right now for Paris Fashion Week,” Kim told People Magazine. She showed off her look at her hubby’s performance at the Foundation Louis Vuitton in Paris and tweeted a picture of herself. Old time friends and our favorite Cheetah Girls reunited after nine years from their onscreen movie “The Cheetah Girls 2” on The Real and it was magical. Raven Symoné came out of the show poking a little fun at her long time pal Adrienne Bailon who is one of the host of The Real. Symoné imitated one of her infamous dance moves from the movies and joked about Bailon’s mascara applying technique. The host of the real joined the former cheetah girls in a dance battle that left the entire audience in stitches. Check out the clip on YouTube. Check out some of our popular posts from earlier in the week like Say Goodbye To Winter Skin: Spring Break Beauty Guide, Best Websites for when you’re bored, and Chris Brown Gains a Daughter and Loses a Girlfriend. Let us know what were your favorite stories or posts this week in the comments or on Twitter using #glamorouspaper.